Heat the lard or vegetable oil in a large casserole set over medium-high heat. Add the pork pieces, sprinkle with salt and pepper, and let the meat cook for a minute or two. Add the onion, stir and let cook for a minute or two. Incorporate the diced tomatoes, mix well, cover and reduce heat to medium low. Cook, stirring occasionally, until the meat is completely cooked through and the tomatoes have cooked down into a mushy paste, about an hour to an hour and 10 minutes. Remove the lid, taste for salt and add more if need be, stir, and continue cooking until there is almost no moisture in the casserole. To serve, place two toasted corn tortillas on a plate, spoon refried black beans on top and ladle the meat on top of the beans. Place a couple avocado slices on the side. So,its March 20th, 2019 and i just watched this episode and can’t wait to buy these ingredients and cook this. It looks so good, so simple too. Thank you. Hope you have fun making and eating it, Claudia! Wonderful, simple recipe. Seems too easy to be possible, but this is really delicious and I use it often. Here it is: https://patijinich.com/recipe/refried_beans/ Enjoy, Rachel! Oh. My. Goodness. How could 3 ingredients make such a fantastic dish?! I made this and served it exactly the way the recipe was written. It was so good!! The next time, I made it and served it as you would street tacos, with diced white onion, cilantro, and lime juice in warm corn tortillas. Wow!!! My family liked it served that way even more!! I’ve made it once a week since then! It’s so easy and simple, but SO delicious!!! Thank you for this now staple dish in my kitchen! I love to watch your show! I’m so happy to hear that it is now a staple in your kitchen, Amy! I know this was a Season 5 episode but it just aired again in our market and we can’t wait to try it. We love Valladolid and this will seem like a mini visit. Oh I hope the lomitos bring back wonderful memories of Valladolid, Doug! Hola Pati. Tried receipe Yumm. I used black beans. Where would I find the peruvian black beans. I go to my fav Mexican market. Gracias. My family is enjoying my cooking. Hello Pati, I saw you make this and i had to make it. But before I do I need to know what kind of black beans I need to make refried. Are they plain cooked black beans or what? You referred to an area because of their flavors. I make cuban black beans with lots of garlic, onion, green pepper, oregano, and olive oil would this work or make the black beans you were refering to? And if so where do I find the recipe? Thank you so much for your help. Oh I was talking about Peruvian black beans…they have a distinct flavor, that is hard to define, but it is stronger than pinto beans and lighter than other black beans. 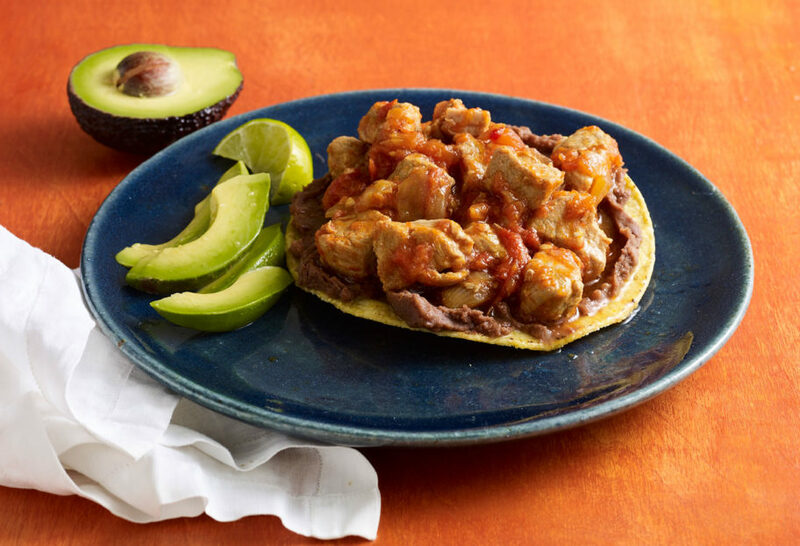 You can follow this recipe using black beans: https://patijinich.com/recipe/refried_beans/ But you can also use your favorite black bean recipe. It needed more seasoning for us. I think a jalapeño would help. I was surprised because Patty usually likes cosas muy picantes. Took 2.5 hours to cook down. I’m glad you tried it Dave, and you can always adjust to your taste. Hi Pati, this is my first time making this recipe. Would you be able to tell me what tomatoes are best for making it? I used Carmelos and I did not get a nice thick paste. Also, I tried looking for an online video on this recipe and I was not able to find it, not even in you tube. I hope it turns out well!!! I like to use Roma tomatoes, but any red tomato will work. The episode is on Amazon! Season 5, episode 8. Usually when I try a new recipe and remake it, it never tastes the same. I have made this dish at least 5 times and it is just as good as the first time. And the husband asks for it all the time! So good!! So glad to hear that Kristin! Thank you! Would love to try this -can another meat be substituted for the pork- a cut of beef? Of course! Try whatever meat you prefer. I need nutritional and calories! ? Sorry Jenny but we don’t track the nutritional data. My son made this for my husband and me our last visit. He said it was now their go to comfort food. And we love it, too. He used the black bean refried beans. That is fantastic! So happy your whole family loves it. Making this for dinner today !! I love your show pati thanks for teaching me as you go !! Made this tonight. Muy delicioso!! I love, love your show. You’re awesome Pati! I made this dish tonight with homemade refried beans. I even made my own corn tortillas! Muy delicioso! I am Mexican born and raised in Oklahoma. My spouse is white and he loves Mexican food. I love your show Pati!! So many recipes. My son and I made tamales! He makes them better than me! Super happy to hear that your whole family loves the recipes! Saw this recipe and wondered if the meat, onion and tomato mixture is considered ‘low carb’? Melanie thank you so much!!! Made this tonight and I loved it! It actually looked like yours! So simple and very good! With so few ingredients I was skeptical about this recipe. Glad I tried it. It’s simple, fresh and very tasty! Wow! Made this yesterday after watching PMT the day before. I love this. So easy. I made a larger batch which took about 3 hours to get the reduction with three pounds of pork and 4.5 pounds of tomato. I shredded the pork during cooking plus added substantial garlic powder and a couple tablespoons of sugar. Served with chopped serrano, cilantro and Herdez Guajillo cooking sauce on the side (a favorite of mine) as condiments. Fantastic! Thank you. Love your show; it’s set to record on DVR. Thank YOU Larry! I can’t wait to share Season Six with everyone! I did the same thing as Gina-thought there was charred garlic in this (was it the soup?). Mine took a while to cook. It may be that I used too many tomatoes. My solution was to put it into the oven at 325 until juices were more stewish. After that, it was just perfect-everyone loved it! We will be making this again! Exquisito!!!! Like you, I could eat this every day! I am making this for Sunday dinner and it smells awesome. Seems so simple to just add salt and pepper. Cannot wait to eat this. Hope you enjoyed it Janet! How can you make the beans quickly con lata? My wife and I have traveled to the Yucatan many times. We cooked your take Valladolid’s Lomitos . We followed your instructions Exactly (took a lot of patience waiting…then waiting some more…) they were AMAZING. The Long wait is sooo worth it. Simple to make. Thanks so much! Have you ever travelled to Puerto Morelos? Perhaps a show featuring this small but beautiful town would be an idea? Thank you Craig (and your wife) for trying the recipe! It’s cooking right now! We had other meal plans for Sunday until we saw this on TV. Made the refried black beans as well. Yummo. Neighbors are coming over and we’re all excited. Our Habanero salsa is assuredly not as hot though. Thanks for your show we love it! Aww Nelson, super happy to have inspired your Sunday dinner plans. Hope you enjoyed it! Hi Pati – I love your show. You are charming. I thought this recipe had five roasted garlic gloves, skin and all in it too, Did I mix up the recipes from last nights show? Thank you so much Gina. There’s no garlic in this recipe…so maybe you’re thinking of another one. The charred garlic goes in the Sope de Lima (same show) and equally good!! Thank you so much Clara. That means a lot to me and the whole team! We tried your pork recipe and made some great tacos the other night! Now that we have a little left over, what type of dish would you recommend with the leftover meat? I was thinking some kind of taco soup, mexican rice dish or pasta. Do you have a go-to dish that you could recommend? We rarely have leftovers in my house between three boys….but you can make rice and beans with pork or more tacos or enchiladas. Hi Pati – Any preference on type of tomato? I think I saw you use Roma tomatoes – is that your preference? Hi Tyler! I usually use Romas, too, but any red tomato will work. Yay! I hope you liked it Alexis. What about adding some jalapeño for additional spice??? The recipe works great for me, but of course you can adapt the spice level to your taste and add jalapeños. Hola Pati, gracias por esta receta, la vi en tu programa el otro día. Me ha quedado buenísimo, Gemma una española desde Seattle, abrazos. Que sabroso!!!! Pati, mi familia le encanta esta receta! Es lo mas facil y delicioso!!! Lo hice con arroz blanco! GRACIAS! Es de mis más favoritas y es ridículo lo fácil que es, verdad? Your recipe says to core and dice the tomatoes, but not to discard the juices or seeds. Do the seeds and juices still go into the pot with everything? Yes, with everything… just made this last Wednesday. Boys love it. Make sure you cook it all the way until the end. The tomato sauce should en up chunky and pasty, not wet. That’s a keeper for sure!! Thanks!